The 14th Dalai Lama was born Lhamo Thondup on July 6th, 1935: to peasant farmers in Taktser, a poverty-stricken village above a wide valley in north-eastern Tibet. Buddhist priests from Lhasa, Tibet's capital were guided by omens to come for the boy when he was only 2 years old. The head of the 13th Dalai Lama had turned in his coffin towards the child's village. Another high priest had seen a vision of a house above a lake. The boy from Taktser was judged to be a reincarnation of his predecessor the 13th Dalai Lama and an incarnation of Avalokitesvara, the Buddha of Compassion. Renamed Jamphel Ngawang Lobsang Yeshe Tenzin Gyatso, the future Dalai Lama was reared by monks in the huge Potala Place in Lhasa. When 15 years old, having been tutored in Buddhist doctrine, he formally became head of Tibet, the political and spiritual leader of 6 million people. Almost simultaneously, neighbouring China attacked at six points along the border. The Chinese Government says their system of government liberated the Tibetan people who had been down-trodden by a feudal theocracy of successive Dalai Lamas. On the other hand many Tibetans say communism was never their wish and they always considered the Dalai Lamas to be benevolent rulers. They claim the Chinese are now "re-educating" the overwhelmingly religious people to a Chinese way of thought and lifestyle. In 1959 the Dalai Lama crossed the Himalayan passes and was granted political asylum in India. A humorous and accessible man, he has been followed into exile by well over a hundred thousand other Tibetans. In 1963, he drafted a democratic constitution under which they, and Tibetans anywhere in the world, could be elected representatives of the government-in-exile. This constitution is a blend of Buddhist teachings and the Universal Declaration of Human Rights. In 1989 the Dalai Lama received the Nobel Peace Prize for his consistent opposition to the use of force in Tibet's struggle for freedom. 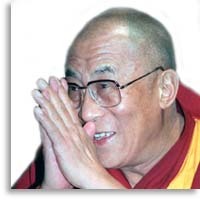 The Nobel Committee remarked: "The Dalai Lama has developed his philosophy of peace from a great reverence for all things living and upon the concept of universal responsibility embracing all mankind." He himself says: "I am just a simple Buddhist monk -- no more, no less."